We Sing Encore is a game about singing. It is not, however, a game about singing well. The game is a sequel to 2009's We Sing, and as the new title suggests, it is really just more of the same, meaning more competitive karaoke for up to four players with 40 new tracks. 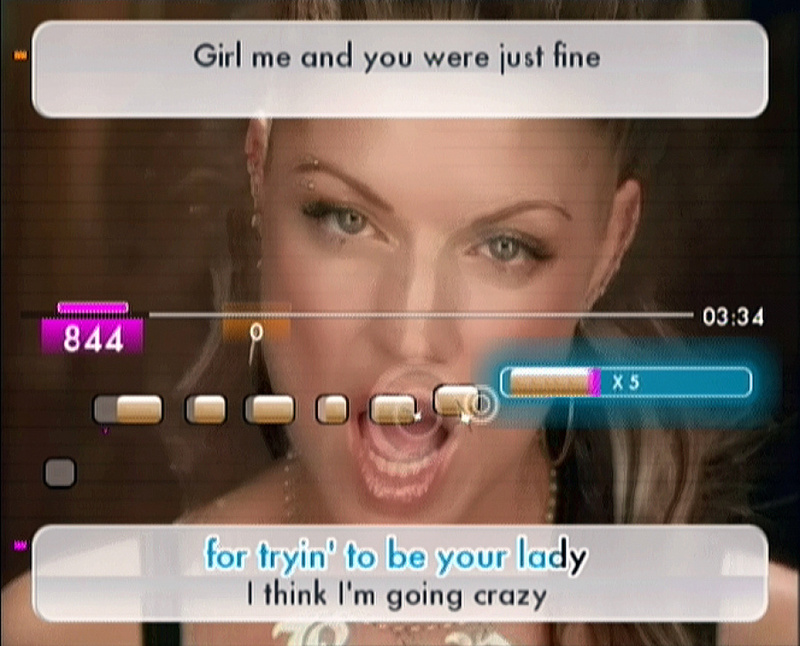 The game sees you singing along to songs of varying quality with the aim of filling onscreen pitch bars and racking up points to get the highest possible score. 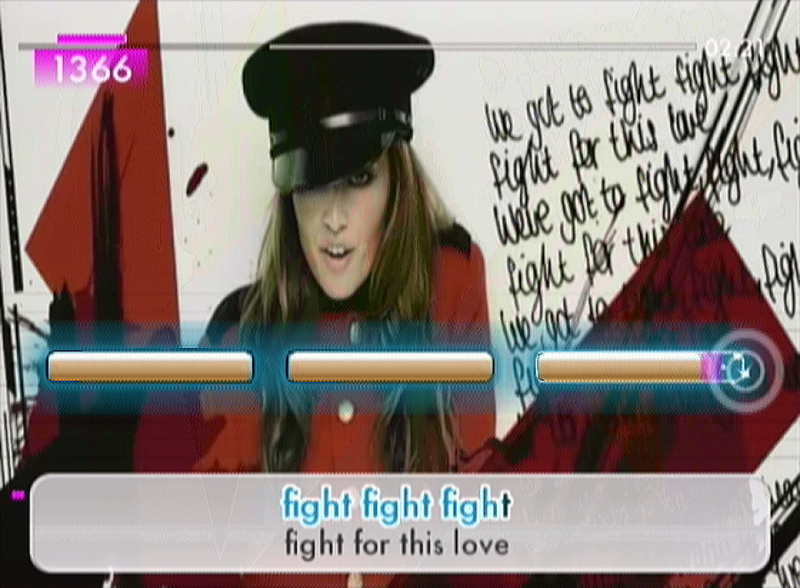 Many would argue that We Sing Encore is slightly derivative of SingStar, Sony's sofa-singing sensation, in so far in that it is almost exactly the same in every conceivable way. The only glaring difference is the fact that We Sing can have up to four players singing at the same time with their own microphones, either competitively or in a quartet. Oh, and the quality of the games is quite different, too. 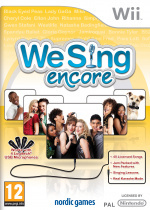 Lone songsters and songstresses can play Solo mode and tackle any one of the game's songs, in either a full or half-length version. After choosing a song you are able to choose a difficulty that affects the margin for error in pitching your voice, meaning that on harder difficulties you really have to work to hold your notes. Not that this is easy at the best of times, because the voice recognition can be all over the place. It is surprising that for a game called We Sing the actual mechanic of singing into the provided Logitech microphones is more a game of chance than anything else. Nine times out of ten you could sing a line of Westlife's "Flying Without Wings" pitch perfectly and only hit half of the onscreen markers; conversely, you could do as the game's box art suggests and let your dog have a bash and watch in awe as he hits every single note, even though he hasn't made a single noise since you unceremoniously thrust a mic in his face. Any sound appears to be preferable to this game over actual, sensible singing; the fact that you can achieve a higher score by talking sternly to the game about its faults than by actually singing really says it all. That's not to say that the singing isn't fun, just don't expect it to matter. The Singing Lessons in Solo play go some way towards explaining how to deal with the game’s flawed mechanics. Split into bite-size challenges, the lessons attempt to teach you how to hold notes and easily change between them using a 'do-re-mi' scale. Unfortunately this mode isn't explained in the most precise manner and you'll spend the first five minutes wondering what is going on while the game carries on without you. Couple this with the dodgy voice recognition and you'll learn about as much from these singing lessons as you did when a P.E. teacher covered your History class. Due to the sensitivity of the microphones you'll find that you end up making a variety of noises until something works, and the result is much closer to speaking in tongues than actual singing. The second you realise that you're sat in your bedroom on your own babbling like a man possessed you'll give up on your tutoring rather sharpish. While We Sing Encore’s voice recognition somewhat mars solo play, the game is still fun in group play. If you can assemble an ensemble of singers in the party spirit, i.e. drunk, then it can be an absolute blast despite its faults. Titled 'Party', We Sing's multiplayer takes pride of place in the main menu, reinforcing the developer’s wish that this game be a group-centric experience. Party has a variety of modes including the cooperative ‘We Sing’ mode, competitive ‘Versus’ and the self-explanatory 'Pass the Mic'. For karaoke pros there is an 'Expert' mode with no lyrics or pitch bars, 'Blind' has lyrics disappearing at random intervals and 'First to X' is a straight race to reach a certain score and not a hunt for buried treasure. Out of these, the ‘Versus’ mode is the most entertaining, even when the game is choosing to score you at random, it can be hilarious to see the noises your friends produce to win. Beating your friends is still fun, even if you only half-heartedly hummed 'I Will Survive' to do it. The developers have plumped for an interesting mix of songs, with classics such as 'Sweet Home Alabama' by the alphabetically ad-libbed Lynyrd Skynyrd, right up to the thoroughly modern 'I Need You' by the equally appallingly spelt N-Dubz. The eclectic mix of tracks means that there will be something for everybody, but conversely a number of songs just won’t be liked or indeed sung; considering that there is no online shop to download further numbers, maybe it would have been wiser to opt for a themed selection. There are some odd choices in the way certain songs are played. For instance, singing Bonnie Tyler's 'Total Eclipse of the Heart' solo you have the choice of singing as either Bonnie and the backing singers, the backing singers and Bonnie, or both: all of these options are the same choice worded differently. In practice it's plain confusing: one minute you are Bonnie Tyler belting out what is possibly your greatest hit, then the next second you are a lowly backing singer, sputtering out the end of the line when you finally realise that you are also meant to be singing those bits. At the end of some lines the two even overlap, meaning you are meant to sing separate lyrics as Bonnie and the backing singer at the same time, a feat which is nigh-on impossible and somewhat ruins the experience. Another minor frustration can be found in the constant switching between the Wii Remote and the microphone. In the menus you navigate with the Wii Remote, yet before a song begins you are forced to waggle the mic to activate it before switching back to the Remote to begin the song and then switching back again to the mic to sing. During extended play sessions, the constant juggling of the two controllers can become a bit of a hassle. In terms of replayability We Sing Encore will last you as long as you have friends willing to sing the same 40 songs over and over again. The single player game gives you a completion percentage to work towards and even doles out collectible awards, but due to the wonky scoring you probably won’t bother going for 100%. 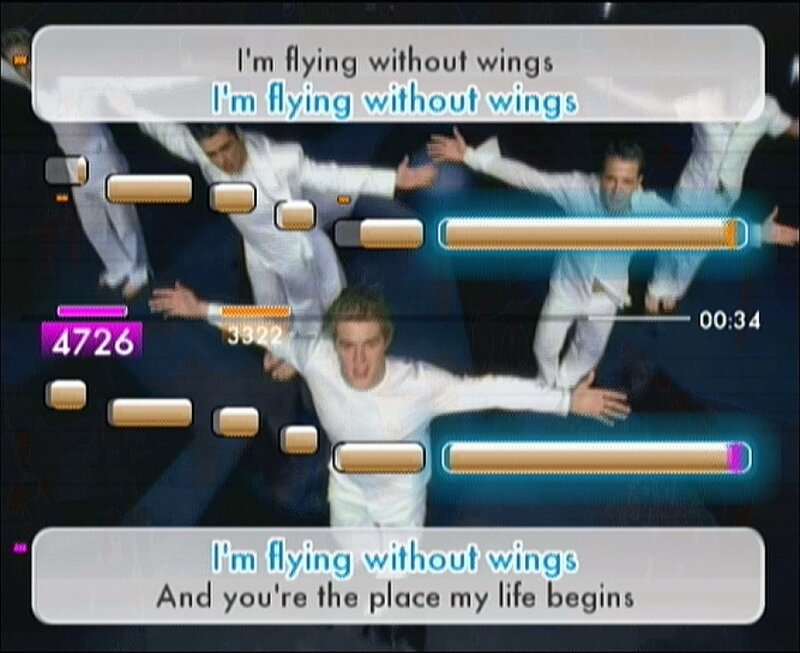 The Wii's limited online capabilities have somewhat stunted the scope of the multiplayer experience, but find four regular players who like singing ‘Gold’ by Spandau Ballet often and Encore could last you a while. We Sing Encore would be a fun and competent, if not entirely original game were it not for the wonky scoring and numerous niggles that hamper the enjoyment throughout. The game has battered the barriers of entry to the point where you actually believe a dog could play it, and not only that, play it well, frustrating those who take their karaoke seriously as it is not an accurate measure of singing ability. There is fun to be had in multiplayer; it’s hilarious to see the depths to which your friends will sink to win a slightly broken karaoke game, but the limited song choices will burn out rather quickly. Like most things, We Sing Encore is at its best when you’re drunk, when your mind can overlook its flaws and appreciate the things it gets right. After all, if you are barely working, then why should it be? I dislike singing games, because I am an awful singer. The Wii would explode. But who here was actually thinking about buying this? I'll play Rock Band instead. And I wish these developers would stop putting the word "we" in all their game titles. We Sing, We Cheer, etc. @MetalMario i bet you dont even play Rock Band. Someone probably asks you to play and you no i dont want to. 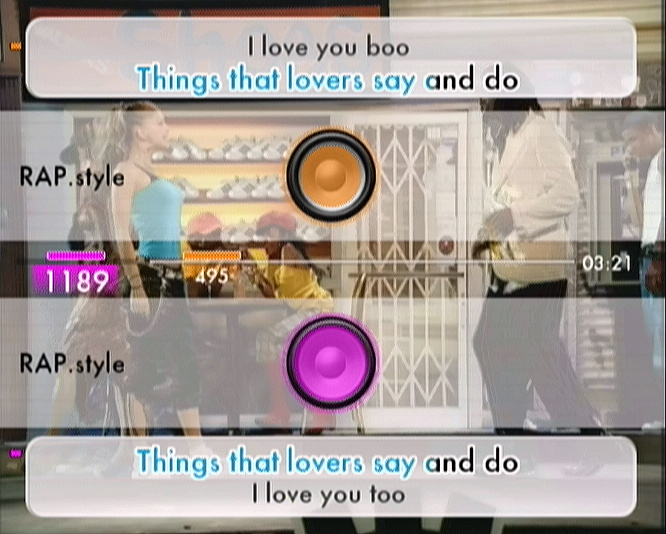 I prefer the system from Karaoke Revolution. It´s better because you up or down your voice when the line arrives and not like Sing it or Singstar that you have to guess if line is fast or long. I hope a new KR soon. I have both Wii and GC and are fantastic. @timp29 I'm pretty sure you'd break the Wii all right.